Cotton is tree free, renewable, recyclable, recovered and energy efficient. Cotton gives archival strength, durability and the paper's velvet, opulent feel. We strongly recommend cotton fiber papers for legal documents. Copier paper will discolor and become brittle in a few years. Use cotton papers for all signed documents and papers sent to clients. 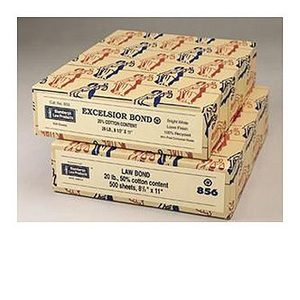 Law Bond is compatible with laser printers and copy machines. Blumberg's house brand papers offer great quality at reasonable prices! FREE Ground Shipping on orders $75 or more to the contiguous 48 states.